For the last six years, Saint Joseph’s University’s Project Haiti in Philadelphia has been assisting the 17 Jesuit grammar schools and 1 vocational school throughout Haiti. 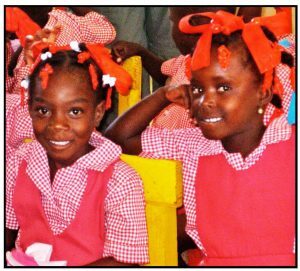 Since the earthquake on January 12, 2010, whose epicenter was just outside of Port-au-Prince, the Haitian Jesuits have started a new school system, called in French Foi et Joie. An official document emanating from a meeting of Jesuits in August 2005, entitled in French Projet de Fondation de Foi et Joie en Haiti and signed by the Provincial Superior of the Jesuits of French Canada, established Foi et Joie in Haiti. Under the dynamic leadership first of Dérino Sainfariste, S.J., and then of Ambroise Dorino Gabriel, S.J., Jean-Maxène Joazile, S.J., and Marcos Recolons, S.J., these schools have been built and furnished, teachers have been trained and hired, and water has been located and shared both with the local communities and made available to the Foi et Joiestudents. These children-centered schools, which have been constructed throughout the entire country, from Ouanaminthe to Jérémie, are already having a tremendous impact on Haitian education. We welcome your continued support of SJU Project Haiti!